The East Side Arts Alliance has been in existence for almost 20 years. 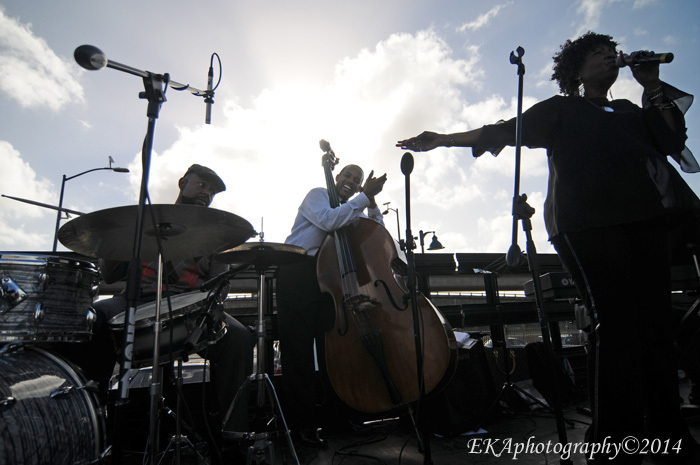 For the past 14 years, the grassroots collective has produced the Malcolm X Jazz Arts Festival, an Oakland cultural institution held every year in San Antonio Park. At their East Side Cultural Center, they’ve hosted numerous dance and hip-hop performance classes, youth workshops, lectures, film screenings, and panel discussions. But until last Saturday, they had never held a block party. Envisioned as a celebration of the 50th anniversary of the Black and Chicano Arts movements, the event was a show of black, brown, yellow and red unity and cultural pride, and a welcome addition to Oakland’s growing number of street fairs and festivals. But it almost didn’t happen at all. Overnight rain showered in the early morning hours of the day of the event, and all morning, dark storm clouds threatened to dump more rain. Light drizzles gave way to a fairly prolonged soaking around 10:30, causing event organizers to grit their teeth, concerned that all the planning which had gone into the block party would be in vain. Then something miraculous occurred. The rain subsided and the sun broke through the clouds, along with stretches of blue sky. The weather went from foreboding to downright pleasant, and the block party was on! That was certainly evident on Saturday, as lowriders, local artisans, food vendors, jazz musicians, social justice activists, visual artists, dance troupes and families with children all came together for a thoroughly enjoyable afternoon which lived up to its billing as a multicultural celebration of diversity and resiliency to the forces of displacement and gentrification. Walking around the party, centered around 23rd Avenue and Int’l Blvd., it was easy to see what ESAA has contributed to the neighborhood: art, and lots of it. 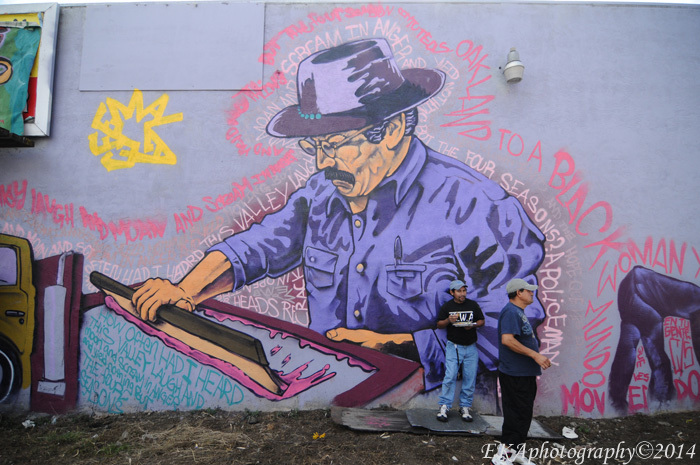 Especially murals, which were everywhere: vibrant, colorful, and often relating the struggles and triumphs of ethnic and immigrant populations. In addition to all the large-scale pieces on walls, there were also several installation-type pieces honoring the upcoming Dia do los Muertes: skeletons made out of traditional paper mache, some dressed up as Brown Berets. Other highlights included a jazz set featuring Howard Wiley (known for his saxophone playing) on drums, with Geechy Taylor on bass, and the vocals of Ms. Faye Carol; as well as a Lindy Hop demonstration by Traci Bartlow and her Starchild Dance Company. All in all, a wonderful event, and a great example of creative placemaking at its best. If you missed it, you’ll definitely want to be there next year. Here’s to another 50, 100, 200 years of Black and Chicano arts! 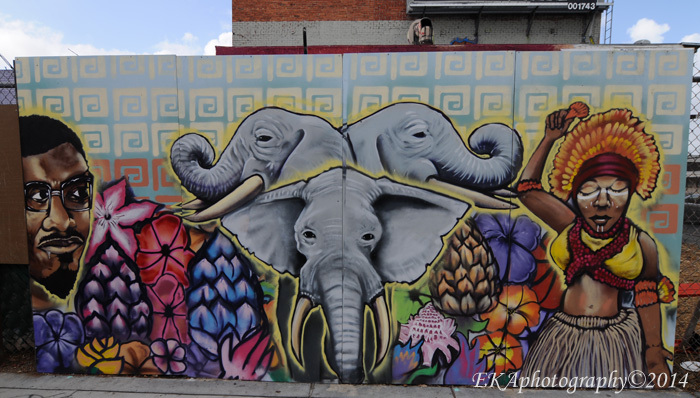 Categories: Event review | Tags: diversity, East Oakland, East Side Arts Alliance, ESAA Block Party 2014, Faye Carol, Howard Wiley, Int'l Blvd., Malcolm X Jazz Arts Festival, multiculturalism, murals, San Antonio, street art | Permalink.